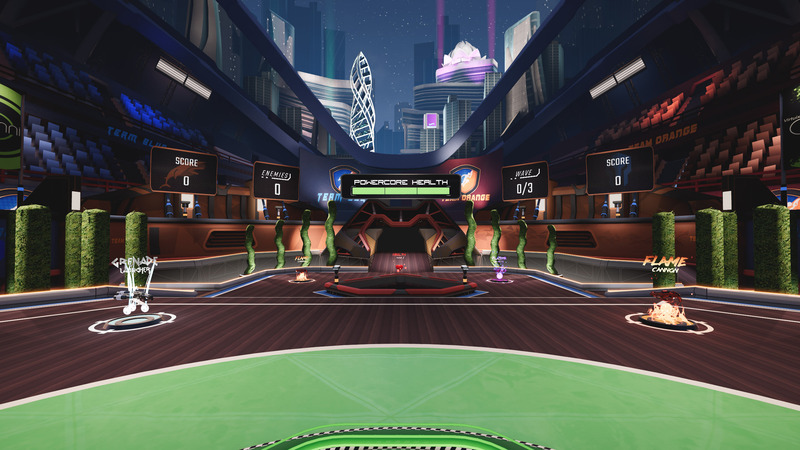 Omni Arena is a VR, FPS developed for PC using UE4. Production started in 2015 when VR development was still relatively new. This wasn’t the first VR project I worked on, but it was certainly the largest by scope and design. As the only full-time artist on the team, development was a challenging and educational experience. I’ll be showcasing some of my contributions to the game below. I was responsible for creating and implementing everything you see here in addition to lighting, collision and optimization. For a detailed explanation on how these environments came to be, including early prototypes and concepts, visit the Blog section. In this section I’ll be highlighting how the weapons and pickups were created. Shown here is a compilation of each of the heavy weapon pickups in the game. To cut down on development time, I used weapon models and VFX assets from the marketplace. These assets were modified to adhere to the functionality of our weapon types. I broke each model down to it’s core components and modified them to more closely fit our weapon styles. Shown here is the difference between the original model (shown on top) and the modified asset. The original textures were also modified to remove unnecessary detail and allow for precise color control in the master weapon material. To enchance feedback given to the player while the weapon was equipped, I rigged each weapon in Maya and created idle animations. Animated materials and particle effects were also implemented. Similar to the models, I modified and optimized emitters from the marketplace for projectile VFX. Shown here is a compilation of those modified effects, along with ones I created from scratch. The pickups needed to be designed in a way that would be easily identifiable and communicate the function of the item to new players. To accomplish this, I modified the projectile particles and created a looping version that sat underneath the weapon model. Custom iconography was sketched and put on a billboard alongside the item. My contributions to the menus included creating visual assets for the environments, widgets and feedback effects. For the final iteration of the menus, I designed the environment in a way that was modular and could be used in multiple areas with minimal adjustments. The backdrops were extended towards the player and a pedestal was placed underneath the player spawn to make everything feel more grounded and less like floating void, which was essentially the environment for the previous menu iteration. I added persistent information like player avatars and team iconography to reinforce the aspect of team affiliation. 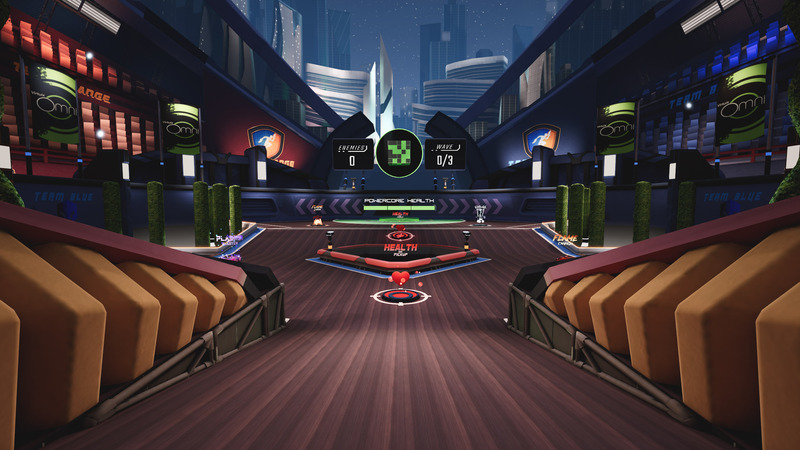 Images of enemies and objectives were used in the menu items to give players a notion of what to look for and interact with once they were in the arena. Visual and sound effects, along with dramatic music and lighting were added to provide a sense of urgency, spectacle and polish. Buttons were scaled-up and their aesthetic was changed for improved readability. Fast, responsive animations were added to widgets to allow players to quickly navigate through the menus. The end result was a menu system that was easy to navigate, fun to interact with, and much more instructional for new players. I conceptualized and designed the UI banner system to help communicate objective status and provide additional feedback, which was lacking in down-times during gameplay. Pramod Ramesh, our Technical Designer was responsible for hooking up game and player state functionality. I was responsible for creating visual assets, as well as scripting custom event sequences for the widgets and banner blueprint. For context: this video showcases the banner system in-game. The construction of the banners consisted of a single mesh and two widgets. Each of these components had custom parameters, exposed variables and custom events that were accessed in the banner blueprint. 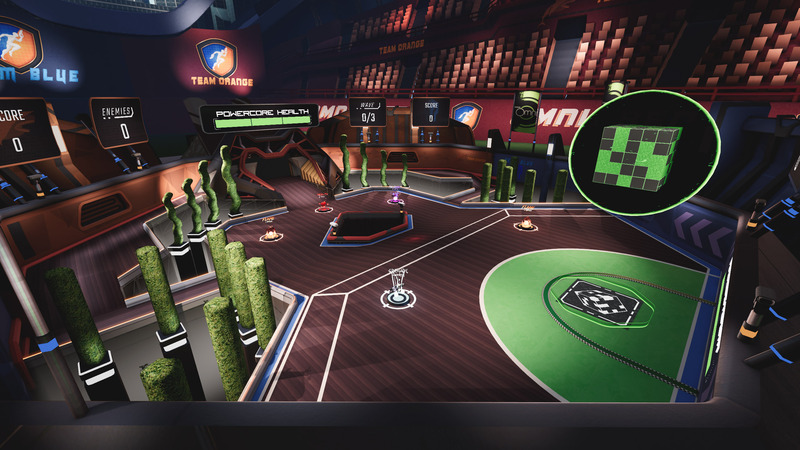 Colors, textures and text were modified based on team affiliation, game mode(s) and game events. The material for the mesh background included parameters to change colors and textures for team affiliation purposes. Opacity controls were added to modify the overall transparency and create the expanding, drawstring effect when the banner first appears and disappears from the player. Functions, components, animations, audio cues and exposed parameters on widgets and materials were plugged-in and modified to create each sequence. These sequences were attached to custom events which were called during gameplay. A unique set of banner sequences were created for each game mode (shown in green and red). While the sequences remained similar in overall construction, each banner set needed to access different information from the game state, depending on which game mode was being played, the number of players, etc. More information on the tutorials can be found in the blog section. My responsibilities here are similar to those in the menus and banner system. The tutorials were co-designed and created by myself and Pramod Ramesh. I created this character to serve as a guiding companion for new players. It was a blast to make, but unfortunately didn’t make it into the game. After modeling was finished and textures were created using Substance Painter, I rigged the drone in Maya and created a couple animations. To enhance the spinning propellers, I made a prop blur and airfoil effect. Theses effects really helped sell the drone’s flight ability. Shadow Ops is a VR, FPS developed for PC using Unity. Shadow Ops had been previously developed by an outsourced studio with an older version of Unity. I was responsible for getting the art assets, lighting and VFX to be compatible with an updated engine. This included redecorating the levels for optimization, improved player direction and thematic purposes. The images below showcase the differences between the two versions of the environments. Space Noir is a third-person, flight combat game developed for the PC. My role on this title was to model and texture enemy spacecraft. I was also responsible for optimizing assets created by other artists. Ember is an isometric RPG developed for PC and mobile. I was responsible for modeling and texturing some 300+ props for the game, some of which are included in the screenshots below. Additional assets can be viewed on my Sketchfab portfolio.